Running the numbers: How much easier are treadmills? Most runners agree that running on a treadmill is a little easier than normal running. But how much easier is the subject of debate. A commonly cited rule of thumb is to set treadmills to an incline of 1-2% to simulate overground running. Others insist that it’s preferable to simply run a bit faster. A third camp is adamant that treadmills “do the work for you”, since you aren’t even moving (duh!). Every time someone says that, Sir Isaac Newton kills a kitten. The debate is heavy on convictions and conventional wisdom, but light on fact. I couldn’t find a single satisfactory explanation in the whole wide interwebs. And my broscience detector was pinging like crazy. So I busted out my mechanical pencil, dusted off my physics notes, made some assumptions and prodded some symbols around until they gave up an answer. It turns out that the 1-2% incline rule is reasonable in most cases. I also found that running 3-6% faster on the treadmill is another option to simulate normal running. In this post, I’ll walk you through some running physics. I won’t claim that it’s in complete layman’s terms, but you should be able to follow along if you stayed awake in high school physics class. If physics isn’t your thing, feel free to skip the derivation and side notes and jump to the results graphs. The physics describing running are complicated, whether or not a treadmill is involved. The starting point for any dynamics problem like this is a diagram of forces, called a free body diagram. We’re going to consider a runner moving at constant speed acted on by three external forces: the force of gravity (aka weight), the aerodynamic drag force (aka air resistance) and the ground reaction force. The force of gravity is constant and we’ll assume that drag is also approximately constant. However, the ground reaction varies throughout the gait cycle. The ground reaction force is constantly changing in magnitude and direction. It peaks shortly after foot strike and is zero when both feet are off the ground. Part of what makes running so tricky to model is that the forces on a runner are never balanced, even during constant speed running. As a result, a runner’s center of mass is always accelerating, or more specifically, oscillating. To simplify this problem, we will only consider the average external forces over a complete gait cycle, and assume that they act on the runner’s center of mass. Since the runner is travelling forwards at a constant speed, the average forces balance, i.e. the net force on the runner is zero. Here are the simplified free body diagrams for treadmill and overground running. Side note: What about friction? The ground reaction force (Fr) is often split into a normal force perpendicular to the surface and a frictional force parallel to the surface that act at the point of contact. The frictional force could be further subdivided into static and kinetic friction components, the latter coming into play if the runner’s shoes were scuffing or slipping a bit. Let’s not worry about any of this since we’re not particularly interested in Fr for this problem. A key assumption is that the only significant difference between running on flat ground and on a horizontal (non-inclined) treadmill is the drag force (Fd). This force only exists for normal running, since a runner on a treadmill is stationary relative to the air (neglecting the movement of limbs, air currents from fans, etc.). We will assume that the aerobic requirements and biomechanics of treadmill running are otherwise the same as overground running, which is a decent approximation [1,2,3]. Of course, there are a myriad of other factors that can contribute to making outdoor running more challenging than treadmill running: hills, wind, traction, weather, obstacles, etc. The conversion factors calculated here are based solely on the difference due to aerodynamic drag (assuming windless conditions), and should therefore be considered minimum estimates. Let’s assume that our goal is to generate the same power output as running on flat ground by setting the treadmill at an incline and maintaining the same speed/pace. That would burn the same number of calories, and it’s reasonable to assume that it would provide a similar training benefit. In physics, a constant force (F) is said to do work (W) on an object when the object undergoes a displacement (d) in the direction of the force. The constant force of gravity on a runner is his mass (m) times the acceleration due to gravity (g). An inclined treadmill lowers a runner’s center of mass a tiny bit each stride. In addition to any work involved in running on a horizontal treadmill, a runner on an inclined treadmill must do some extra work against gravity each stride to raise his center of mass and remain roughly stationary. Let’s assume that a runner does not recover any of this energy (i.e. that the potential energy isn’t converted back into useful kinetic energy). A runner on a treadmill inclined at angle Ɵ and belt speed vt generates power Pg as he works against gravity. We are only interested in the component of the velocity vt in the same direction as gravity (i.e. vertical). Substituting the expression for Fg gives an equation for Pg. where ρ is the density of the fluid (air in this case), Cd is a dimensionless number called the drag coefficient that depends on the shape of the object and other factors, A is the cross-sectional or frontal area of the object and v is the speed of the object relative to the fluid. Using the general equation for power above, we can find the power consumed working against drag (Pd) for a runner with speed vg. 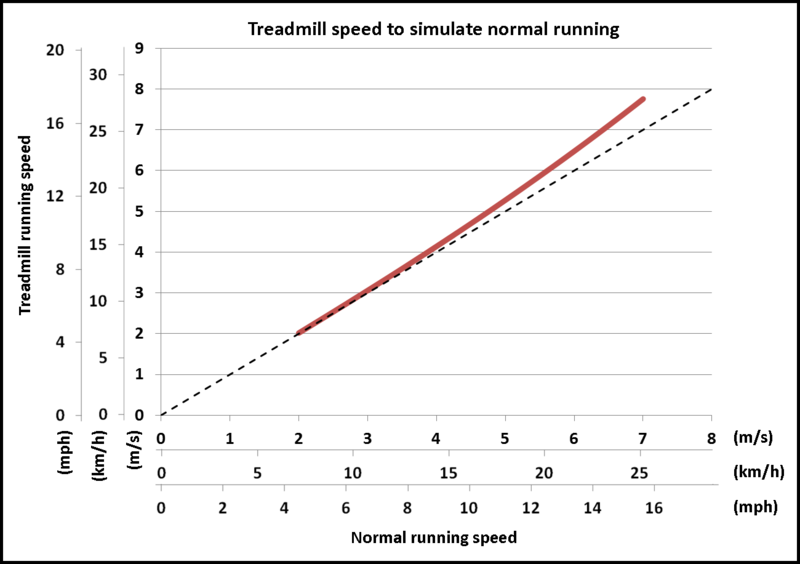 To produce the same power on the inclined treadmill, the rate of work against gravity on the treadmill must be equal to the rate of work against drag for normal running. Since our goal is to maintain normal running speed on the treadmill and only vary the angle of incline, we set vg = vt = v and solve for Ɵ. Now we need to assume some values for the constants. 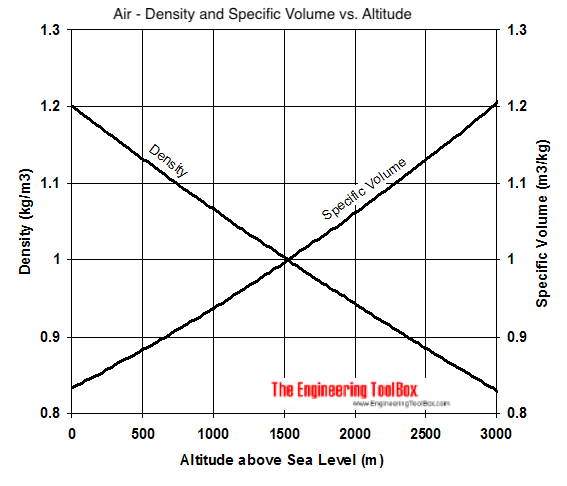 The density of air at sea level is ~1.225 kg/m³. The acceleration due to gravity is ~9.81 m/s². Cd and A are a little trickier to measure. Fortunately, a study measured drag on 331 people standing in a wind tunnel wearing a variety of clothing! We’ll use the average value for Cd of 1.2 and A of 0.55 m², giving a CdA of around ~0.6 m² (let’s round down because runners tend to be leaner than the general population). For reference, a super aerodynamic cyclist could have a CdA under 0.2 m² and most cars have a CdA in the range of 0.5-1 m². Finally, we’ll use a mass of 68 kg (~150 lbs) and a speed of 5 m/s (18 km/h, ~11.2 mph) equal to a pace of 3:20/km. Plug it all in and you get Ɵ = 0.8°. Inclines are more commonly expressed as a percent grade, which is given by 100tanƟ, equal to 1.4% in this case. 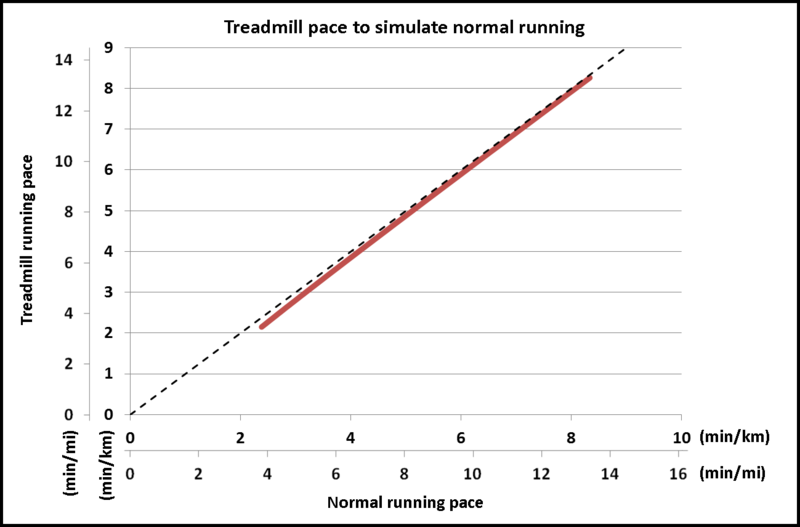 Relationships between treadmill incline and normal running pace (top) and speed (bottom) predicted to produce equal mechanical power output are below. The solid line is for our average runner. Since runners come in all shapes and sizes and the density of air can vary quite a bit (with altitude, temperature, pressure and humidity), the dashed lines represent cases where combinations of the parameters are 20% higher or lower than our base case. 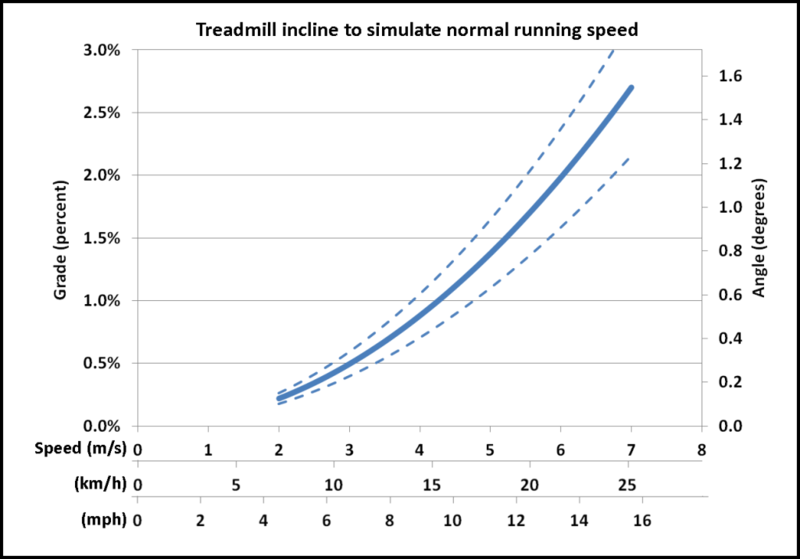 Treadmill incline predicted to produce a mechanical power output equivalent to overground running at the same pace (top) or speed (bottom). The solid lines represents an average runner with a mass of 68 kg (150 lbs) and a CdA of 0.6 for sea level air density (1.225 km/m³). 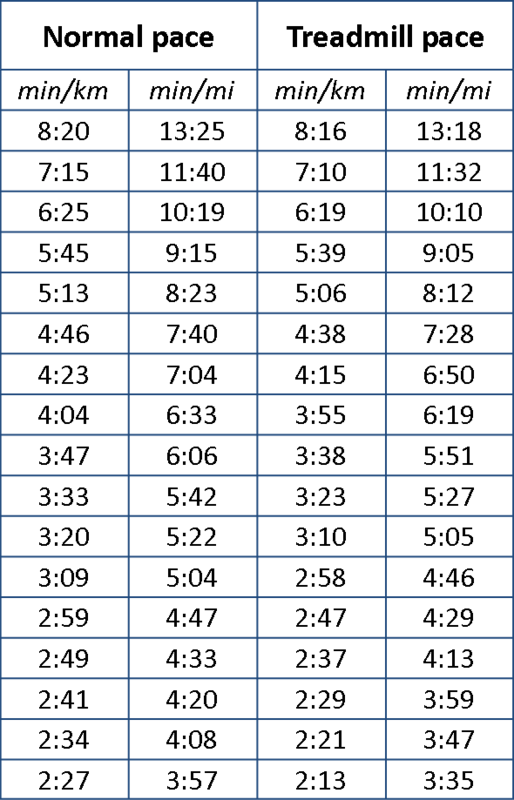 The dashed lines represent cases where combinations of these parameters are 20% higher or lower than the base case. The predicted relationship isn’t very sensitive to runner size, since lighter runners would tend to have a smaller area and m and A have opposite effects in the equation for Ɵ. Even so, I would caution against applying it in extreme cases: Shaq doing a treadmill workout at the center of the Earth, a speedsuit-clad midget on Mount Everest, parachute running, etc. 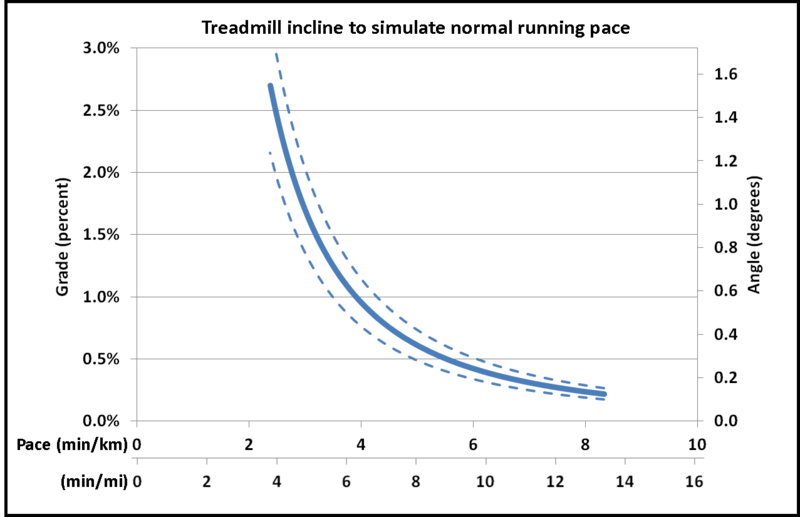 Conclusion: The 1-2% incline rule of thumb for treadmill running is predicted to be fairly accurate over faster running speeds (<4:00/km, >10 mph). If you’re running slower than that, then 1% is probably overkill. It’s reassuring that this theoretical calculation agrees with some experimental evidence: A 1% treadmill grade most accurately reflects the energetic cost of outdoor running. “But hold on,” you may be thinking, “a runner on a treadmill isn’t moving upwards, so how can they be doing work against gravity? In fact, they aren’t traveling at all!” Indeed, from the perspective (or reference frame) of someone standing on the ground, the runner on the inclined treadmill doesn’t appear to be moving in any direction at all. That is to say that the average velocity of the runner in the reference frame of the ground is zero. Now imagine that there is someone else (temporarily) standing on the treadmill behind the runner. From their perspective, the runner appears to move forward at an average velocity of vt, which is the speed of the treadmill belt in the reference frame of the ground. 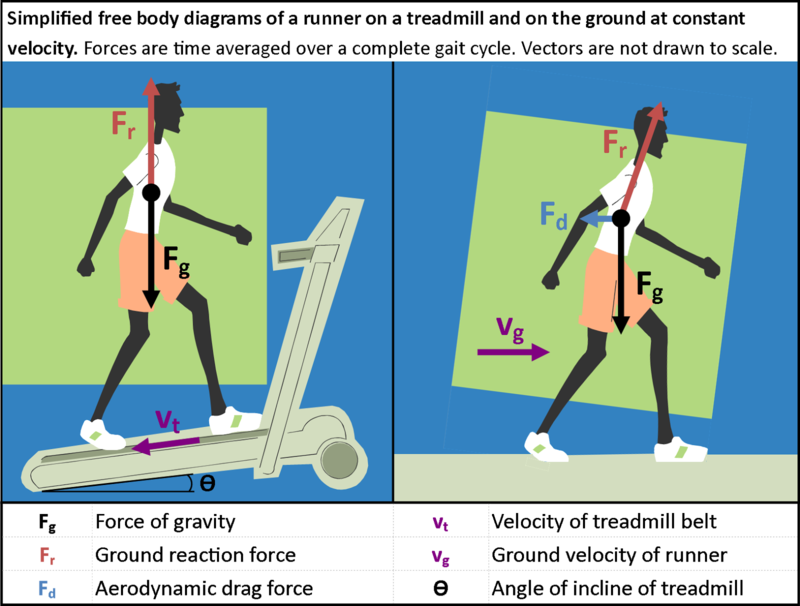 In the reference frame of the treadmill belt, the runner has a non-zero velocity vt. What really matters is the velocity of the runner relative to the running surface. “Ok fine, but all runners bounce up and down, so their velocity can’t be constant.” Correct. A runner’s center of mass oscillates, but with each gait cycle, it returns to a slightly higher point than it started at in the reference frame of the inclined treadmill belt. Relative to the belt, the runner moves upwards with an average speed vt sinƟ. Therefore, Pg is the average or net power against gravity over a complete gait cycle, not the power at any instant in time. Some people claim that constantly running on an incline, even a slight one, screws with your biomechanics. They say that it’s preferable to increase your speed instead to compensate. The question is, how much? To find an answer, we will leave the realm of reasonable physics behind and stray into the domain of engineers—guestimation, conjecture and hand waving—the stuff that gives some physicists fits. We’ll again assume that our goal is to produce equal power on the treadmill as on the ground, but this time by increasing our speed and leaving the incline at zero. First, we need a model for the mechanical power output of running. We’ll use a highly simplified model derived here and discussed here. Now let’s set the power equations for treadmill and normal running equal to one another, using the speeds defined previously. Solving for vt, we get a speed correction factor that can be added to normal running speeds (vg) to produce equivalent power output on the treadmill. Using the same values as before, this equation predicts that a treadmill speed of ~19 km/h (~3:10/km pace) is equivalent to a normal running speed of ~18 km/h (3:20/km pace), which seems reasonable. 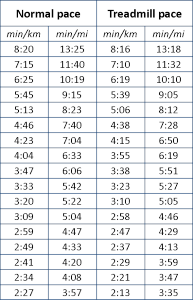 The relationship for our average runner over a range of speeds and paces is shown below. The dashed lines indicate a 1:1 ratio, illustrating that the effect of aerodynamic drag is quite small at low speeds. Treadmill and overground running speeds (top) and pace (bottom) predicted to produce equivalent mechanical power output. Calculations are based on an average runner with a mass of 68 kg (150 lbs) and a CdA of 0.6 for sea level air density (1.225 km/m³). The dashed lines indicate a 1:1 ratio, i.e. no aerodynamic drag. Check out this article for a good discussion. In short, there’s no clear answer. Personally, I don’t notice much difference running on a slight incline other than a small increase in exertion. I’m more likely to notice the increase in my stride rate and length due to running a few percent faster. For fast running, I would opt for some combination of the two, say ~1% incline and a couple percent faster. Side note: How accurate is this model? In the first two cases, the terms cancel out when we set treadmill and normal running power equal. One assumption in the derivation of the model is that none of the energy used to raise the body’s center of mass each stride is recovered when the center of mass is lowered again. Intuitively, that seems wrong. However, in the likelihood that that assumption is an overestimate, it would help compensate for the unaccounted power losses discussed above, possibly improving the accuracy of the model. Another test of the model is the ratio of power to overcome aerodynamic drag to total mechanical power. Very little data exist for drag on runners, but we know that it should be a small component of total power at typical running speeds. Indeed, the model predicts that power to overcome drag only accounts for ~2% of total mechanical power at 5:00/km (~8:00/mi) pace, ~5% at 3:30/km (~5:40/mi) pace and ~9% at 2:30/km (~4:00/mi) pace. Finally, note that the model predicts that mechanical power is directly proportional to speed if we ignore the small drag term (that goes like v³). If efficiency (the ratio of mechanical power to total/metabolic power) is roughly independent of speed, then the form of the model is supported by empirical evidence that running a given distance requires roughly the same amount of energy, regardless of speed. Experiment and theory both suggest that if you run twice as fast, you cover distance twice as quickly and consume energy at about double the rate. Disclaimer: I’m a jack-of-all-trades science consultant and sports science hobbyist, not a biomechanics or physics PhD. If you think I screwed up somewhere, let me know in the comments below.